'He should remain unaware of history and knowledge of anything that has happened. Congress President Rahul Gandhi dug himself into a hole by asserting in London that the Congress party was not involved in the October 31-November 4, 1984 anti-Sikh riots in the wake of then prime minister Indira Gandhi's assassination. 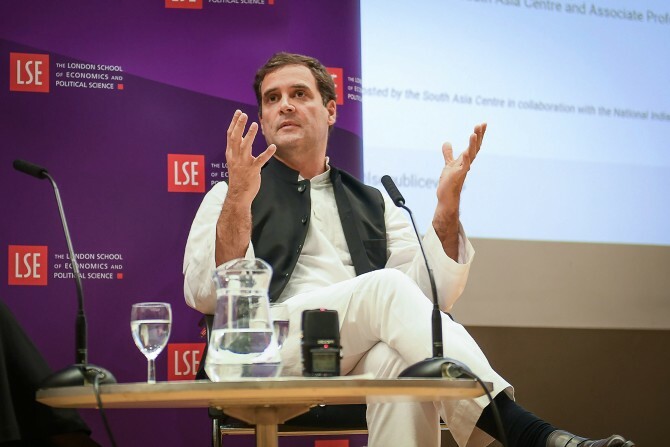 At a meeting with British MPs in London on August 24, Rahul described the violence as a 'very painful tragedy', but insisted that the Congress was not involved. The Shiromani Akali Dal described Rahul Gandhi's statement as 'rubbing salt into the wounds' of the Sikh community while its ally, the Bharatiya Janata Party, said the Congress president was trying to wash his party's hands off its alleged culpability in the riots. Even as a controversy swirls over Rahul's statement, Hartosh Singh Bal, political editor, Caravan magazine, spoke to Rediff.com's Syed Firdaus Ashraf about the 1984 riots on which he has written extensively including an essay in the book 1984: In Memory and Imagination -- Personal Essays and Stories on the 1984 Anti-Sikh Riots. For a generation which has little idea about the 1984 riots, can you tell us how far the Congress party was involved in it in which 2,733 Sikhs were killed? Let me correct the terminology. The 1984 riots were not riots as two communities were not clashing, but it was a massacre of Sikhs. They were being pulled out and killed. There was no resistance from their side and there was no counter-violence. The actual numbers were 3,000 Sikhs died in Delhi. Across the country there were 7,000 deaths. This figure is from the sources which has been verified and tallied. The massacre was not in Delhi alone, but spread across other states like Uttar Pradesh, Madhya Pradesh, Haryana and Bihar. It was widespread. I have written in Caravan about it. People like Mr H S Phoolka and Manoj Mitta have written about it and they have documented this. In each pocket of the city prominent Congress leaders led mobs. These leaders include Sajjan Kumar, Jagdish Tytler and Kamal Nath. My own report, and I have testimony from a senior bureaucrat who said that coordination of this violence was being done by Arun Nehru, Rajiv Gandhi's cousin and right hand man. During this period he was reporting to Rajiv Gandhi on a regular basis minute to minute and there is no way Rajiv could be unaware of this organised implementation of violence by his senior party member. What do you make of Rahul Gandhi's statement that Congressmen were not involved in the massacre, or Chidambaram's point that he was just 13 years old at that time? Rahul Gandhi was not born in 1947, so is he unaware of what happened in 1947? Does every politician only rely on eyewitness testimony? He can't read, or is he illiterate? Has he not read or heard anything that continuously figures in contemporary politics, that continuous questions are asked to him all the time? Can he remain ignorant of that by saying he was 13 years old and in school? That means basically Rahul Gandhi must not talk on any subject in this country that precedes his adulthood. He should remain unaware of history and knowledge of anything that has happened. Rahul Gandhi must not talk about the Babri Masjid too. Rajiv Gandhi in a public speech justified the 1984 violence by saying when a big tree falls the earth shakes, as if the assassination of Indira Gandhi was a justification for the violence that followed. Subsequently, when the Congress party went to the elections it was on a communal platform. In some ways it was a model for the 2014 election fought by Modi. What Modi did with the Muslim community in terms of communal bigotry, Rajiv Gandhi did with the Sikh community. Obviously, they won't be convicted. They (Congress governments) set up the inquiry commissions. They handpicked the people who led those inquiry commissions. They ensured no procedure was followed. They allowed no police investigation. Ranganath Mishra, head of the first inquiry commission, was later rewarded by the Congress party with a Rajya Sabha seat, that too a Congress seat. No norms of commission were followed. Innumerable commissions were set up and the Congress ensured that none of them functioned, the legal processes did not happen. The legal processes were directed, controlled and manipulated by the Congress, so obviously there would be no results. Nine commissions of inquiry were set up to probe the massacre of 1984, weren't they? Commissions of inquiry in this country are largely meant to suppress the truth than reveal it. They serve political ends to justify. It is like what has happened with the Special Investigation Team Report on Modi. You read the report, it is meant to bury Modi and not to examine his culpability. This is what the nine commissions of inquiry (probing the 1984 riots) were about. Every trick Modi has played, the Congress has played before. That is where Modi has learnt his tricks on how to subvert and manipulate the truth. You have written that Girilal Jain, the then editor-in-chief of The Times of India, rationalised the violence, saying the Hindu cup of patience had come full to the brim. Is that why Sikhs were being targeted? When communal bigotry is given official sanction, as was the case with the Congress, you have enough endorsers where people come out of their little holes in the ground and express their bigotry in public. This is what Girilal Jain did. This is what pro-Modi editors are doing today and so are TV anchors. The same hatred, the vitriol that was coming out against the Sikhs, the same kind of hatred is coming out from the journalists (now) who have no self-respect, but cater to the whims and fancies of the government. As mourners filed past Indira Gandhi's body on the Doordarshan telecast, slogans like 'Khoon ka badla khoon se' were heard. Should that telecast have been permitted? Was it done intentionally? These questions are to be asked and reported on. It was absolutely the most absurd thing to do. I can find no other equivalent of it in the use of public media or using an act of violence to provoke reactions. I guess the only comparable example would be again to take the bodies of those killed in Godhra and march them around in Ahmedabad. That was done by Modi. As I said, every action has been preceded by the same kind of idiocy by the Congress. Deliberate manipulation of public opinion -- why call it idiocy? It was deliberate. Then prime minister Manmohan Singh did apologise for the 1984 violence. He spoke on behalf of the government. Any violence under its watch, it (the government) must regret. But where has the Congress party admitted culpability and apologised for its own involvement in the violence? Give me a single instance. People keep saying Sonia Gandhi did, but she didn't. Not for a moment did Sonia Gandhi apologise for the 1984 massacre of Sikhs. The so-called statement which she uttered, I was reporting personally in Punjab then. She never said anything that amounted to an apology. She never has, the Congress party never has. Why are the Gandhis not apologising for the violence when Manmohan Singh has? Dr Manmohan Singh did it on behalf of the government and not the party. The Gandhis cannot do it because the culpability is personal.